Direct personal contact was made with the offending resident or property owner almost every time a hazard was reported, and in the absence of direct contact, fliers and postcards explaining the new policy were left. Under pressure from bike advocates and the City Council, city managers changed the leaf program to its current form fall of 2009. Instead of encouraging landscapers to block the bike lanes, they decided to enforce already existing city ordinances which make it illegal to block the public right-of-way, including bike lanes, with leaves and debris. They also designated 25 miles of bike lanes as “high-priority” for weekly cleaning (see PDF at the bottom of this post) and created a website where cyclists could report blocked bike lanes. The River Path is also cleared by leaf blowers about once a week during leaf season. The discussion centered around the enhancements that were made for the 2009 leaf season and their results. The enhancements included the designation of 25 miles of “high priority” on-street bike lanes, the purchase of an additional leaf vacuum to focus on the high priority lanes, and the creation of a 24 hour online form used for reporting leaf hazards. City officials explained that 2oo9 was especially successful because the weather cooperated. The same crews that clear bike lanes also deal with snow storms and flooding, and the lack of weather issues this year allowed them to focus on leaf collection. 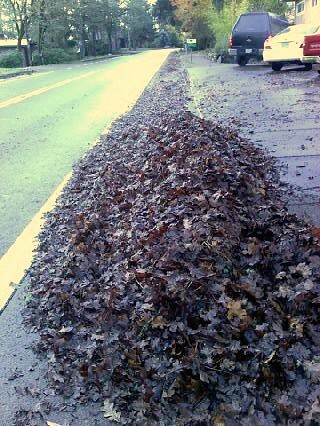 17,ooo cubic yards of leaves were picked up in the 2009 season. This was slightly more than the previous year. Most were delivered to citizens and community gardens, and only 400 cubic yards (2%) were taken to recycling areas. None of the leaves went to a landfill. [City spokesman Eric Jones] concedes that there were some negative reactions last year to the changes. The city as yet has not had to deal with repeat offenders who blatantly disregard the new regulations, Jones said. Should such a situation arise, the city could start legal proceedings in the form of a “nuisance abatement” action. But Jones said the city hopes it doesn’t come to that. Use this button, permanently located in the column on the left, to report hazards in the Eug/Spfld area year-round. When you encounter a bike lane or path blocked by leaves, you can report it via the City’s website, WBE’s Hazard Reporting Guide, or call (541) 682-4800. City officials prefer that people use their website rather than their phone number, because the website makes it easier to keep track of repeat offenders and assure that hazards are cleaned. If the area is outside of Eugene (Springfield/Glenwood/County), refer to WBE’s Hazard Reporting Guide for information. At the City’s website you can also track the leaf pickup progress, so you can plan your routes to stay on clear streets. You can also upload a picture of the hazard to the Flickr group Eugene Bike Accesibility Issues. This creates a public record of the hazard and you can include a link in the picture in your report to the City, aiding them in locating the hazard. Click here to download a PDF flier about the City of Eugene leaf program, which you can give to people whom you’d like to politely inform about the City’s “new” policies regarding leaves in the bike lane. You also may want to familiarize yourself with Oregon Revised Statutes 814.420 and 814.430 (PDF), which state that bicyclists can leave the bike lane and ride in the “car” lane “when reasonably necessary to avoid hazardous conditions,” including debris. Below is a PDF of the “high priority” bike lanes which are cleaned weekly. Why does this program even exist? Residents whine about “Big Government” and yet expect the City to clean up their leaves for them. Here’s a thought: Take personal responsibility for your landscaping, gather up your yard debris and put it someplace else besides the public streets. Ah craps. Thanks for pointing that out. It is my understanding that the City instituted the the leaf program to deal with stormwater and flooding issues. Of course even if the City didn’t tell people they could place the leaves out for collection there would be issues with leaves in the street that the City would need to clean up (since leaves don’t selectively fall away from the street). That being said some advocates have called for an end to the program all together or to cut it back to just clean up of those leaves that do fall naturally into the street and have residents clean up their own leaves. However, that would mean many more leaves going into our landfill rather than being composted or utilized. I think it would be a worthwhile conversation to have but from what I have heard there are a lot of people who think the leaf collection program is an important service for the City to perform and I think that with the current steps they are taking it is a pretty good program that is working much better for cyclists. I especially like the city website’s right sidebar with buttons to request pickups, request leaves from said pickups, and track the cleanup on Google maps. With these tools, I could use my tax dollars to get the city to deliver compost fodder to me and track the delivery online while I wait. I’m just curious if anyone has had any positive or negative responses from the city when reporting leaves. I reported leaves that keep a bicyclist from having access to the button to change the light at Alder and 18th a week ago, but so far, no action (as of Monday). I reported the leaves on 24th this week, but haven’t been through again to check.